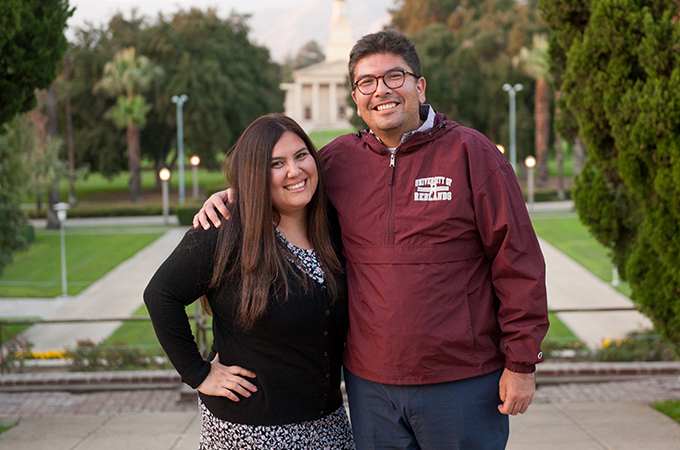 After meeting in the University of Redlands School of Education Multiple Subject Teaching Credential program, Omar Aguirre ’06, ’18 and Beatriz Rodriguez ’18 became friends. They supported each other through the credential program, then encouraged each other to continue on to earn a master’s degree in school counseling. Upon finishing their studies this year, they will both be the first in their families to graduate not only from college, but also from graduate school. Aguirre and Rodriguez have a lot in common. Raised by parents who immigrated from Mexico and constantly emphasized the importance of education, the two were both students in Redlands’ public schools, from kindergarten to 12th grade. After Aguirre earned his undergraduate degree and teaching credential, he worked at the Language Assessment Center for the Redlands Unified School District. Interacting with the parents of underserved and non-English speaking students at the Center made him realize that he was already using counseling techniques to advocate for students, and he saw a degree in school counseling as a next step forward. Rodriguez, who was working as a second-grade dual immersion teacher in San Bernardino, suggested they tackle graduate school together. As part of the master’s program at the School of Education, Aguirre and Rodriguez were impacted by many different faculty members, including Professor Jeanie Lohr. After taking her group counseling course, the two felt they were prepared for real-world academic counseling environments. Both of them say that the program strengthened their friendship. Learn more about the University of Redlands School of Education.